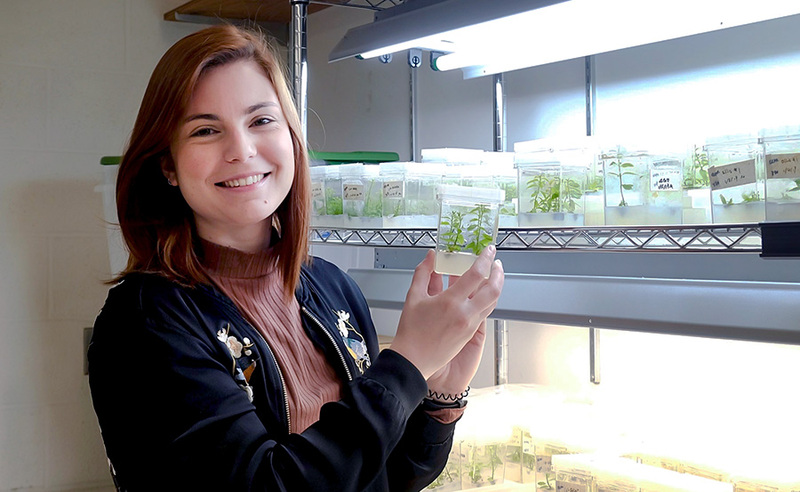 Patrícia Fernandes - a Fulbright scholar and Ph.D. student - came to ESF from her native Portugal to further her research on the European chestnut tree. Under the guidance of Professor William Powell, director of ESF's American Chestnut Research and Restoration Project, she learned a genetic engineering technique with the potential to help ensure the sustainability of chestnut production in her home country. The European chestnut is an economically significant forest species in Europe. In Portugal, the tree is a particularly important source of timber and high-quality edible fruit. "Portugal is one of the biggest producers and exporters of chestnuts," said Fernandes. "In some parts of the country, families rely entirely on chestnut production for income." European chestnuts face a different threat from the one that nearly wiped out their American counterparts, which have been a focus of restoration efforts at ESF for more than three decades. Powell and his team have developed blight-tolerant American chestnut trees, which are now undergoing the federal regulatory approval process. The goal is to obtain approval to distribute the trees publicly and, eventually, to reintroduce them in their natural environment. Fernandes came to ESF because of that body of knowledge. The primary threat to European chestnut production is Phytophthora cinnamomi, a pathogen responsible for a lethal condition called ink disease (a.k.a. root rot). Its spread has resulted in economic losses in Portugal and beyond. Susceptibility to the pathogen, however, varies within and between chestnut species. Understanding and improving P. cinnamomi resistance is the central goal of Fernandes' research. Fernandes earned a master's degree in plant biotechnology from the University of Coimbra in Portugal; she is now pursuing a Ph.D. from the Institute of Chemical and Biological Technology - New University of Lisbon. In 2015, she joined a team of chestnut researchers at Portugal's National Institute of Agrarian and Veterinary Research, IP (INIAV). Among the species studied at the lab are Japanese and Chinese chestnuts, both of which exhibit natural resistance to P. cinnamomi. "My project is focused on understanding the resistance of Asian chestnut species to the pathogen that causes ink disease," said Fernandes. The lab's research is connected to a chestnut breeding program initiated in 2006 by Fernandes' advisor, Dr. Rita Costa-a senior research scientist at INIAV. The program works to produce hybrids combining the pathogen resistance of Asian species with the qualities of the European chestnut. The improved plant material will be distributed to help ensure reliable and economically profitable chestnut harvests. "My project allows me to not only expand the knowledge of Phytophthora resistance, but also to help with a breeding program that will have a final product that can be seen, shared and commercialized," Fernandes said. The identification of P. cinnamomi resistance genes is an important step in developing improved chestnut varieties, both for European and American chestnut species. Previous studies at INIAV detected a gene that is potentially related to resistance. Before the candidate gene can be validated, it must first be inserted into a susceptible chestnut through the process of transformation. The resulting "transgenic" plant can be inoculated with the pathogen to evaluate the plant's response. Chestnuts are particularly difficult plants to transform, according to Fernandes. "I've worked with plant tissue culture for many years and dealt with a lot of species, but there's nothing like chestnut," she said. "Its tissues challenge every protocol they are submitted to." For assistance overcoming the challenges of chestnut transformation, the researchers at INIAV turned to ESF. The American chestnut was nearly wiped out by a pathogenic blight in the 20th century. Powell and his team developed a blight-resistant transgenic American chestnut that contains a resistance-enhancing gene from wheat. It is added to the chestnut genome through Agrobacterium-mediated transformation. "Dr. Powell's lab has a highly optimized protocol for genetically transforming chestnut," said Fernandes. "Their set up is like nowhere else in the world." Fernandes was eager to learn Powell's transformation methodology. "The protocol allows us to insert a gene of interest into chestnuts with a high success rate of transformation," said Fernandes. "If we can replicate this back in Portugal, we can use it to test all of the candidate genes for Phytophthora resistance." In her free time, Fernandes contributes to ESF's American chestnut research. "I help out however I can to learn as much as possible about the restoration project," she said. "I am very thankful to have been part of their amazing research team." "Patrícia is a very bright, helpful and enthusiastic researcher," said Powell. "We are very grateful for her many contributions to the American chestnut project, and we believe that her experience with our team will help further her own research at INIAV and her career in her home country." The Fulbright scholar will return to Portugal with more than scientific knowledge. "I plan to take back all of this good energy and the customs I learned," she said. "This was about more than work; it was a chance to meet amazing people and have a new cultural experience."